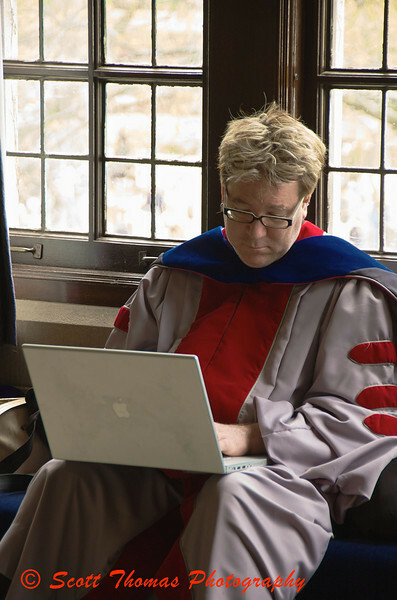 Professor Jeffrey K. MacKie-Mason checking email between graduate ceremonies at the University of Michigan. Professor Jeffrey K. MacKie-Mason checking his email outside the Mendelssohn Theater before the University of Michigan School of Information’s graduate recognition ceremony on Friday, May 1, 2009. Professor MacKie-Mason is wearing his Ph. D. robes from the Massachusetts Institute of Technology (MIT) and has good taste in laptops. This entry was posted in People and tagged apple computer, email, graduation, gray, laptop, macbook pro, michigan, mit, phd, Photography, professor, robes, university of michigan, window. Bookmark the permalink. I hope he didn’t get dressed up to check his email. I like that his robes match the notebook so well. 🙂 Nah, he came over from another ceremony and was waiting for the next one to start. I enjoy the irony of medieval scholar’s robes with the wireless laptop. Nice lighting, Scott. Universities are full of such images. Old buildings on the outside but refitted on the inside for today’s modern technologies. Awesome composition of light and color. Dating back to Mid 19th century, this could be a paint. Thanks, Anran! It does have the feel of a painting. The window light was mostly blownout so I had to do work with getting that under control. I see you are from UofM (nice photos by the way), where did you hear about this post? Okay…this post is getting hundreds of hits. You all coming from the University of Michigan? Drop me a comment! Your daughter sent the link out to SI. As info specialists, we’re compelled to look! LOL Glad you and other SI students and faculty are stopping by! Good luck to all the recent grads!